Here’s why Kre-Alkalyn® EFX is formulated to win! Kre-Alkalyn® EFX represent a major breakthrough in performance supplementation thanks to its multi-patented, ‘pH-Correct®‘ creatine stabilization technology. Our scientist discovered that “buffering” to pH-12 produced a stable creatine molecule. 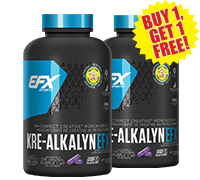 Kre-Alkalyn® EFX is the only creatine monohydrate product with a pH of 12 because its molecules are synthesized with ‘buffering’ agents using a patented (#6,399,661) manufacturing process. FROM THE LAB TO THE GYM! Twenty-four elite athletes from the Bulgarian National Weightlifting Team† were selected to participate in a double-blind clinical study(1) comparing Kre-Alkalyn® to standard creatine monohydrate. † Elite athletes using 7.5 g of Kre-Alkalyn®. Individual results may vary. Referenced: (1) Stoychev K., Terziiski N. (2006). “Comparison of Kre-Alkalyn to Creatine…performance, & safety”. 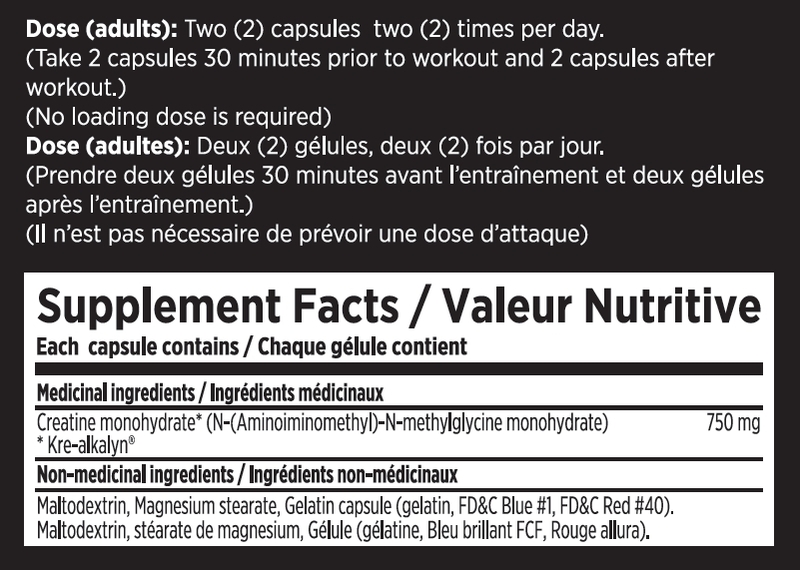 Take 2 capsules daily, or 1 hour before your workout.